All of our stretchers were shipped with shoulder, chest, pelvis, and leg straps. The stretchers were designed to function with all of those straps in place for any patient movement and transport. Omitting straps, especially the shoulder straps, is not the manufacturer’s indications for use and is not safe for your patient. The only exceptions to using all of the required straps and belts would be a serious patient condition that prohibits the full use of them all for some reason. This should happen very rarely. The picture to the left is an example of typical alignment of straps. Yours may be slightly different (closer to the knees for instance) and the patients arms do not have to be strapped in. 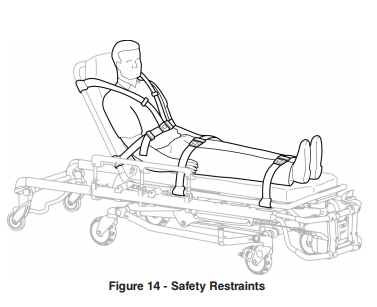 If your patient is on a scoop stretcher or LBB, the strap configuration is the same. At the start of your shift, you should inspect the straps to ensure that they are all present, in the correct locations and not broken or severely worn. Issues should be reported to your chain of command. Please ensure they are securely buckled and snug the straps down so they aren’t too loose while the stretcher or vehicle is in motion.